Can we make crockpot Wednesday a thing? Not going to lie, it seems all I have time for lately is to throw dinner into the crockpot, forget about it all day while I work, and then realize it’s nine o’clock, and um, dinner time! I feel like a lot of us are in the same boat (while maybe not the nine o’ clock dinner part), so more crockpot recipes, right??! Speaking of being busy, have any of you noticed that we are less than two weeks from Halloween?? I do not even know how that happened, just insane. AND you guys, I haven’t given you a baby goat update since mid September! Ahh, I think now is the time! We’ve talked about selling the boy goats, but trust me, that is NOT happening. Every time I watch all five of the babies playing together, it reminds me that there is no way we can separate them. I mean, I know it’s kind of how life works in the animal world, but not over here. They are just too cute. 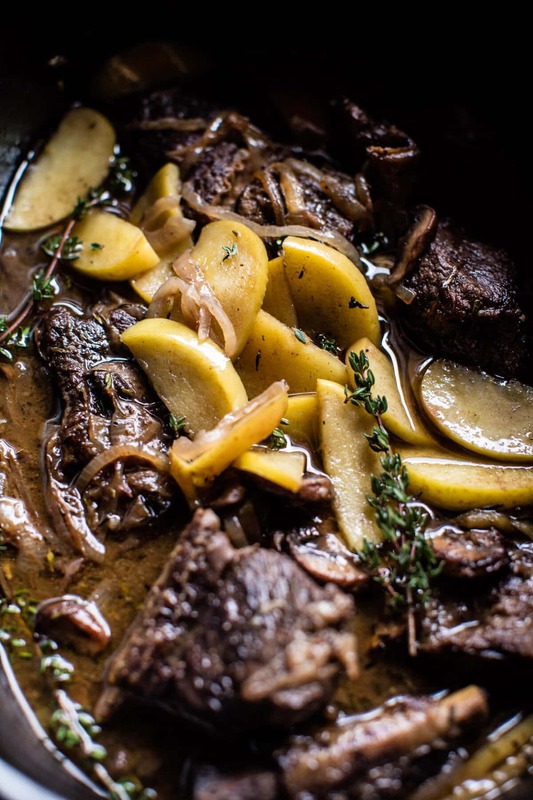 Ok, leaving the farm now, back to recipes, and crockpot cooking, and THESE Crockpot Cider Braised Short Ribs! …one: nothing beets short ribs that have been cooked low and slow for eight hours. They fall off the bones and are just so darn good! …two: apples… in a savory way! I was just writing a story for my cookbook manuscript and I mentioned that I loved using apples, not only for baking, but for cooking as well! In fact, I might just like using apples in savory recipes even more. Or well, it’s at least a tie! Obviously, the fact that this recipe is super easy, makes it just that much better! I do like to sear my short ribs on the stove before adding them to the crockpot, I know it’s kind of a pain, but the added flavor is so worth it! 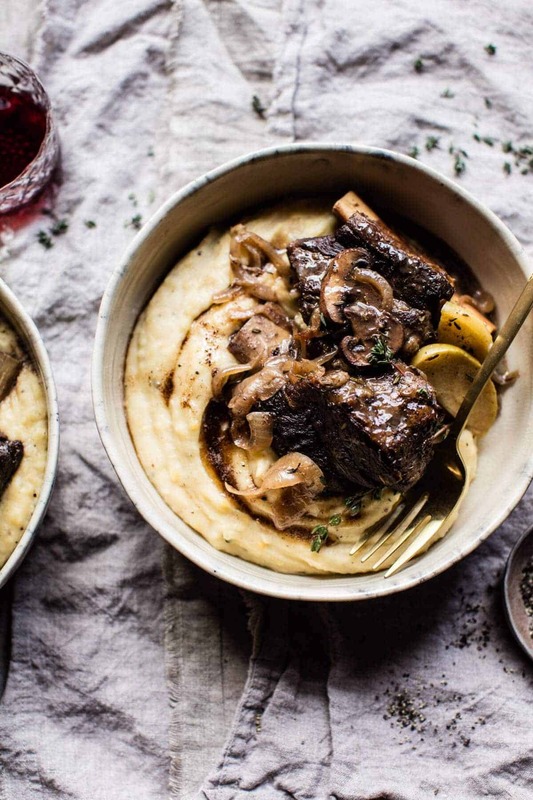 The cider adds a nice sweetness and pairs well with the meaty short ribs. Not to mention, it creates the most perfect sauce to spoon over those mashed potatoes, which yes, have me way too excited for the Thanksgiving feast that is coming up! Also, I know it’s only Wednesday, but how perfect is this for a Sunday night dinner? I dunno why, but I truly LOVE Sunday night dinners. There’s something so cozy and wonderful about them. This meal feels like the perfect fit! 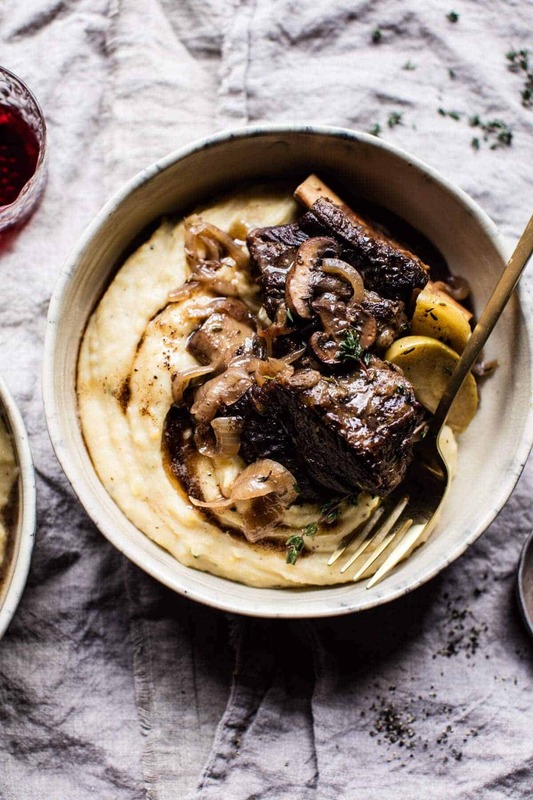 Crockpot Cider Braised Short Ribs with Browned Sage Butter Mashed Potatoes. Heat a large heavy bottom skillet over medium high-heat. Add the ribs to the skillet and sprinkle with salt + pepper. Sear the ribs on all sides for about 1 minute per side. Remove the ribs from the skillet. Arrange the onions on the bottom of your crockpot and sprinkle the brown sugar over them. Add the seared short ribs, garlic, mushrooms, apple cider and thyme. Cover the crockpot and cook on low for 7-8 hours or on high for 5-6 hours. During the last 1-2 hours of cooking, add the apple slices, tossing to combine. Once the short ribs are done cooking and easily fall apart, skim off any fat from the top of the crockpot. Lightly shred the ribs and remove and discard the bones. Keep the rib meat in the sauce, covered on low heat until ready to eat. About 40 minutes before you’re ready to eat, make the potatoes. In a large pot of cold water, bring the potatoes and garlic to a boil. Salt the water and cook until the potatoes are tender, about 20 to 30 minutes. Drain the potatoes, return the potatoes to the pot and mash over low heat, or mash in the bowl of stand mixer fitted with the paddle attachment, adding the cream, cheddar cheese, and 2 teaspoons salt. In a skillet or small sauce pot, melt the butter over medium heat until just browned. The butter will melt, foam and froth, then begin to brown along the bottom. Whisk browned bits off of the bottom of the pan. Stir in the sage and let cook 30 seconds. Pour the browned butter into the warm mashed potatoes. Taste and season with salt and pepper if desired. Divide the mashed potatoes between plates and top with the rib meat. Enjoy! PS. there’s cheddar in those mashers. Yup! I love cooking savoury dishes with apples too!!! Sadly my son does not like it at all, so I don’t often indulge buahahahahahah. Oh mash potatoes. I live for mash potatoes. I love mash potatoes soooooo much I wouldn’t even want bread with this!! They’re so good!! I so agree!! Mashed potatoes are amazing!! You will remember we have spoken before when I asked if I could use your recipes on my website. Each day I get a mail from you I continue to delight in your joyously generous food. Much love from Cape Town South Africa. Thank you so much!! I’m so happy you enjoy them!! Are you gonna do goat cheese with all the goat milk?? Also, this looks so yummy ! This sounds so incredible! Sage is one of my favorite herbs ever. I love it so much! Thanks Jessica!! It is delicious!! Also, side note: One little typo I thought you’d like to know about.. Thank you!! Happy you like it!! Oh this looks so amazing. And since it’s supposed to drop back into fall like weather this weekend seems like the perfect crock pot Sunday dinner. Yes! Bring on the fall weather!! Thanks Julie!! Yes, make crockpot Wednesday a thing 🙂 Love the slow cooker and coming home to a house smelling DELICIOUS! Me too! And its so easy!! Hope you love it Julie!! SO COMFORTING!!!!! those taters look like a damn pillow, so dreamy. YES!! Love me fluffy potatoes!! Thanks Christine!! This sounds so cozy and delicious and I think you are so right about Sunday Night Dinner! I love crock pot meals and this just sounds like the perfect fall meal to make the weeknights better! They’re the best!! Makes the house smell great and they’re so easy!! This is fall heaven… Oh my word. I love fall food (: Thank you!! You have no idea!! haha! The best feeling!! Ok, so I made the browned butter mashed potatoes tonight! Yep, tonight! I love sage so I couldn’t wait. But I had it with the left over crockpot braised red wine short ribs (thanks for that one ??) I made on Sunday. And OMG delicious! Thank you! And also can I ask what dinnerware you use (is that rude)? Every time I see a photo I think “I love that dinnerware!”. Absolutely love the flavoring, can’t wait to bust out the slow cooker for these ribs! Yes!! Hope you love it Matt!! no worries! 🙂 thank you! 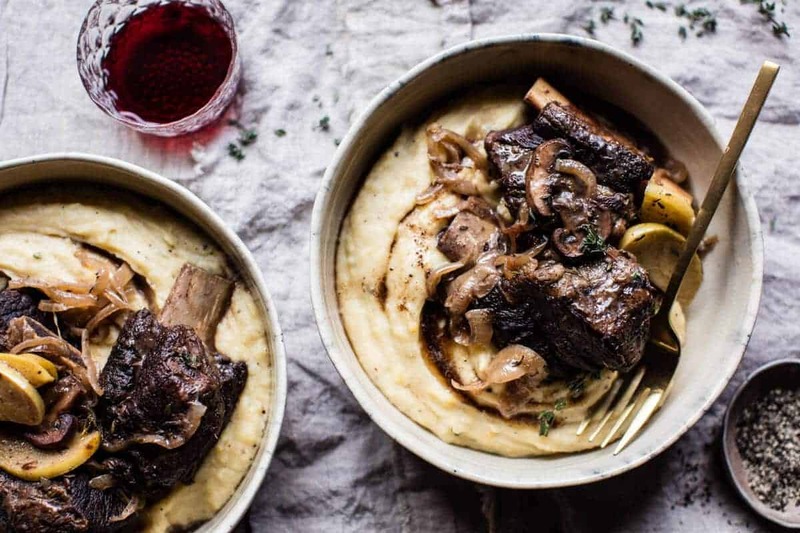 Short ribs have to be one of my all time favorite fall/winter recipes! I’ve never tried to make mine with apple cider. Sounds incredibly flavorful! Can’t wait to try Tieghan! Hope you love them Mary Ann!! I wish all recipes would come with nutritional data. I cook for someone that is on a sodium restricted diet. And at time, it appears there is more sodium in a recipe than there really is. This looks delicious and I will try it on myself soon! Hi! I am sorry, but I just do not feel comfortable providing that. It can be calculated online. Thanks! That would be great! I wish I could provide them!! Still hope you love it! How big does your crock pot need to be to hold 5 pounds of short ribs??! a 6 quart crockpot or large. Let me know if you have questions! I hope you love this one for Sunday dinner Sheila! Thank you! Can I make this recipe in the oven? If so, should I change the “liquid” ratio? Hey! Yes, that works great! Cook at 325 for 3-4 hours. No need to change the recipe. Let me know if you have questions. Thanks! I can’t wait to make this! I only have boneless short ribs (they were on sale), would you change cooking time? Or any other suggestions with what I have on hand? Hey Amanda! That should be fine, I would not change the cooking times. Let me know if you have questions. Thanks! I just made this for Sunday dinner and taste tested it and let me tell you it is AMAZING. I made very minor adjustments. I had 3.5lbs of short ribs cut the long way, not english cut which is thicker and instead of two cups of apple cider, I used 1 and 1/4 cups of apple cider and a 1/4 cup of beef broth. I was concerned with the amount of acidity that the apple cider would give but I knew it was serving as a tenderizer for the short ribs. When my boyfriend tasted the short ribs alone he said they needed salt. I thought they did too BUT something said trust Tieghan, she knows her stuff. Glad I did because the Brown Butter Sage Mashed Potatoes provide all the salt you need so when you eat this as a complete meal, Oh me Oh my. The flavor profiles are amazing! This dish tastes like it came from a Michelin Star restaurant/chef. 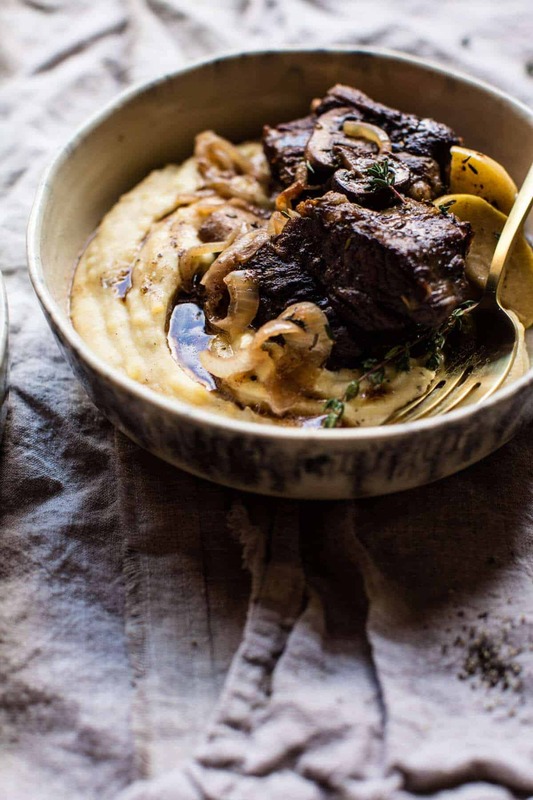 I loved the ease of the dish and yes, please sear the short ribs before putting them in the crockpot. I hope my family saves me enough to take for lunch tomorrow 🙂 This dish is one of thee best I have ever tried at home. Sounds so amazing!! SO happy you loved this one and it turned out amazing! Thank you!! Just had this for our Sunday night supper and all I can say is WOW! Made exactly by recipe and all the flavors are wonderful together. The apples add a special touch and the mashed potatoes are divine. Will definitely make this again and again! Yay!! Makes me so happy these turned out great for you, thanks Channa! 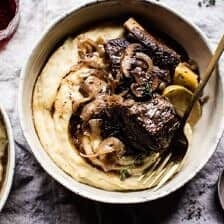 I’d love to make this crockpot recipe.. but is there a way to replace the short ribs with something non-meat? Maybe a type of fish or a medley of vegetables? What do you think? Any recommendations? Btw, this looks insanely delicious! HI! So, this is a pretty meat heavy recipe, but you might try a medley of vegetables. I think fish is too delicate for the crockpot. I would go with winter squash or root vegetables. I am sorry, I can’t really suggest anything more as I have not tested the recipe this way. Thank you! Oh my goodness… I can’t even tell you how awesome this recipe turned out. I used half the meat, and replaced it with 1 lb of baby carrots. My fiancee really enjoyed the meat with the cider sauce, and I had my version without the meat (I’m vegetarian) with the mashed potatoes. And the mashed potatoes were out of this world! I used truffle salt instead of regular, it just added more awesome flavor! Thank you for sharing such deliciousness! Yay! This is so awesome to hear Ella! So glad the both of you had an awesome dinner and enjoyed this recipe, thank you! Ah your so welcome! I’m so happy you liked it!! First just need to say how much I love your website, besides the great recipes your photography is stunning. Wondering if you brown the ribs in a dry pan or if you need to add any oil? Or are short ribs fatty enough to keep themselves from sticking? Whoops! Just noticed the oil in the ingredient list! Feel free to delete this question. Saw you found the oil, let me know if you have any other questions. Thank you! My husband is not a big fan of sweet/fruity flavors in his dinner meal. (Made quinoa in apple cider once and he was not impressed). So my question is, is it an overwhelming apple taste in the ribs? Or more subtle? Should I maybe do a cup of cider and a cup of broth? Leave out the apples? Also, neither of us are a fan of mushrooms- any recommendation for a good substitute? I don’t know where you live, but around here they usually stick the cider near the produce. Hey Michele, I use apple cider, not vinegar. The vinegar will be too strong of a flavor. If you cannot find apple cider use apple juice. Let me know if you have questions. Thank you! tomorrow…cuz I started at 7pm! But I realized too late the butcher gave me the wrong cut on the ribs – they’re Korean style. So I don’t think I can still shred the meat. What do you think? Also, husband bought apple juice instead of cider – what’s the difference? !i used it but I imagine it will just be sweeter? ? Hey Heidi! I don’t think you will be able to shred them, but I think they will still be delicious. And yes, I think just slightly sweater with the apple juice, but that will be nice with the korean ribs. Hope you love this! Hello! Made this tonight with a 3.5 lb rack of baby back ribs because no short ribs were available that were Greenwise (no antibiotics, no hormones meat). I omitted there oil and just kept a careful eye to keep them from sticking to three pan too much. I cut back on the butter a bit, by maybe 2 oz and will cut it down to 4 oz if I make it again, which is extremely likely. This was delicious and you again exceeded my expectations, Tieghan! Decadent! A good meal to impress someone with if you are having company. ? All sounds so delish!! Hope you like it even more with your touches (: Thanks so much Kristi! My sister is allergic to mushrooms. Is there a good substitute for mushrooms or should I just leave them out? Hey Kit! I would just leave the mushrooms out. Hope you love this and Merry Christmas! ? This recipe looks delicious! 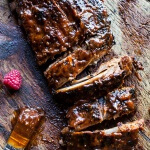 Would you change anything if using pork ribs instead of beef? Thanks! Nope, make the recipe as directed. Hope you love this! anyone going vegetarian try putting barley in your recipes, I use it in chili sometimes and don’t miss the meat. It has a nice chewy mouth feel to it !! maybe a silly question – but what do you do with the garlic cloves after the potatoes are done cooking? discard them or blend them in with the potatoes? Thanks!! Hey Chelsea! You blend the garlic into the potatoes, it’s delish! Let me know if you have questions. Hope you love this! This recipe was fantastic. Silence followed the first few bites, then collective sighs around the table. Thank you for a perfect winter comfort recipe. Awh sounds so perfect! Thanks so much for making it Kathleen! WOW! This looks fabulous! Love short ribs. Pinned. I’d love you forever if you adapted this for the Instant Pot! I am the worst at slow cooking because I cannot for the life of me remember to put dinner on in the morning. Ah I will keep this in mind to try & convert it! Any updates on doing these in the instant pot? Thinking about for Christmas dinner! Thanks, love your food so much! I love, love short ribs and I just made some, I didn’t put in apples but the next time I will. 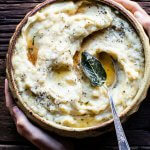 Your brown butter mashed potatoes look fantastic, especially with the added sage. Thank you so much Gerlinde! I hope you love these! Super excited to make this recipe again! I made it last year and it was a massive hit for a dinner party my husband and I hosted. I’m making it again this weekend and am wondering if it can be done in an InstaPot…if so, I’m assuming to put it on high pressure, but am not sure how long to cook it for. Would you have a suggestion? Thank you! I made this for company as the recipe states. It was expensive. It was amazingly delicious! Guests were still raving about a year later. The ribs taste exactly like chuck roast after they’re cooked…so I now make the recipe for 1/3 the price without giving up flavor or tenderness. Booyah! I am so happy you loved this Wendy! Thank you!! Hey! I’m so excited to make these for my boyfriend’s birthday next weekend! I’ve loved every recipe I’ve ever made off of your blog. 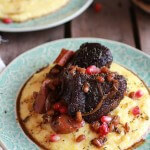 Did you use English style short ribs for this recipe? I am having 10 people over and 5 of them are big meat eaters. Do I double the entire recipe if I want to make for twice as many people? I’m going to try this recipe tomorrow! In the photo it looks like the meat is still on the bone. The notes suggest taking if off the bone and shredding it before serving. Does it matter if I serve it on or off the bone? I made this over the weekend and it was delicious! 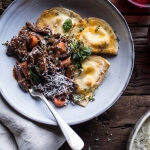 The next day I blended together the leftover short rib, mushrooms and onions and made short rib ravioli with a sage brown butter sauce. The beef was just as delicious the second time! I am so happy you enjoyed this Rachel! Thank you! Yes! Crockpot Wednesday is a thing in my house! Love this recipe. Will definitely have to try it. I hope you love this Sara! Thank you! I’ve just finished putting this recipe together and am so excited to try the finished product!! One suggestion…I tend to get my ingredients together first and then move on to the instructions. In the ingredients list, it says “chopped” apple…so that’s how I prepared them, but when I got down to the directions, it says “apple slices” … so I had to get two more apples and slice them, haven’t decided what I’ll do with the chopped pieces just yet. So sorry about that! I am really glad you liked this recipe though! Hello! My daughter-in-law has made this recipe, and it’s delicious! I’m going to try making it for a dinner get-together soon, but will have 6-8 hungry people. Will the recipe still turn out okay if I double everything? Or at least increase everything by 50%? Thanks! I made crock-pot Saturday a thing last weekend. It ruled! I wasn’t impressed with the quality of the short ribs at the market (too bad, because I LOVE them) but I found an exquisite 7.5 pound chuck roast on offer, and used half of that instead. (The other half went in the freezer, and will become slow cooker chili soon.) I also had 5 carrots on hand that needed a purpose, so I added those in with about 4 hours cook time left. It came out absolutely phenomenal! The sage butter was a really nice touch! Perfect! I am so happy to hear that! Thank you so much Aline! 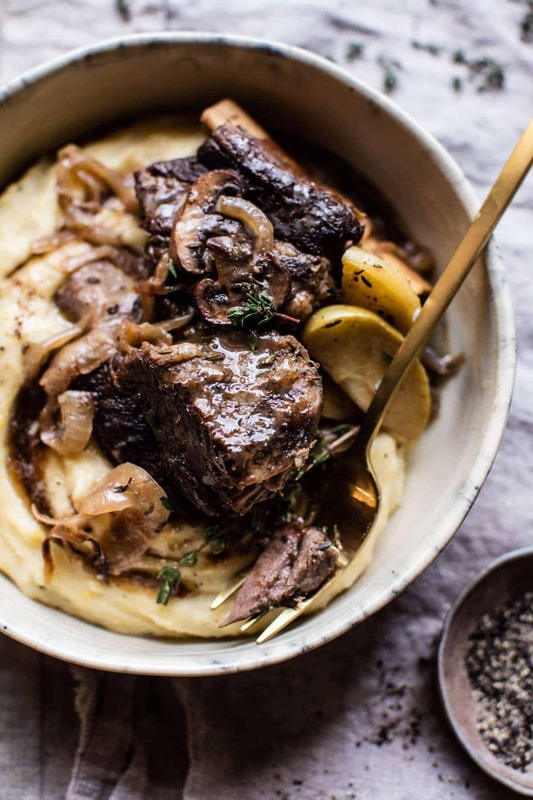 Am I able to make this in the oven instead of the slow cooker….I’m thinking follow the same sort of principle for the short rib recipe in your cookbook? I made these for Friday night dinner. As I read the recipe I began to worry about how sweet they might be with apple cider and brown sugar and no acid in the recipe to offset the sweet. I left out the brown sugar. I baked these in the oven for 3 hours and tasted, very sweet. I add 1 T. franks hot sauce and 1 T. dijon mustard. Perfect! We gobbled them up with cheese mashed potatoes. Fed 4 grown men and myself with left overs. I am so glad you loved this recipe, Kelly! Thank you! Hello, I love your site. Can you we use the instant pot for this dish? Any suggestions on the time? This was really delicious. I made it dairy-free by substituting walnut and truffle oil in place of the browned butter, and coconut cream in place of the heavy cream—a happy anniversary was had by us both, and enough to serve a whole family on might two. Thank you so much Scott! I am so glad you loved this recipe! I really want to make this recipe this weekend!! What apples could I use if I can’t find Honey Crisps? Thanks! Just finished eating this meal for dinner. What bliss! I love the slightly sweet mixed with savory, &, of course, short ribs are a super delicious cut of beef. My husband & I ate until the food ran out. Well, that’s not quite true; I’ve still got some of those yummy mashed potatoes ….. and some of the sauce. Now guess what I’ll be heating up in the oven tomorrow for lunch. I couldn’t find a bottled hard cider that wasn’t alcoholic, so I used the alcoholic stuff. What’s a few bubbles? The bottle wasn’t quite 2 cups, so I added a bit of unsweetened, unfiltered apple juice to make up the balance. Hi Nancie! I am so glad this turned out so perfectly for you! Thank you so much! This recipe looks delicious! I love short ribs. I received a pressure cooker as a gift and since it also sears I thought this recipe would be perfect to try. I haven’t tried using this pressure cooker yet so I’m not sure of the time as opposed to the slow cooker. Any advice would be appreciated. I enjoy receiving your recipes. Thank you. Hi, do you have any tips on how to cook this in a pressure cooker/instant pot? Thanks! Can I use Boneless Chuck Short Ribs with this recipe??? I did NOT like this. In fact it smelled so bad cooking that I dumped it in the trash. We ordered takeout.